Patrick Hruby: Power to the Players? Editor’s note: following reports that players on the Grambling State football team had ended their six-day strike, Sports on Earth asked writer Patrick Hruby to share his thoughts on the matter. The Grambling State football team refused to play a scheduled game against Jackson State last Saturday. Why? * Travel. According to the letter, the team bused to away games this season in Kansas City and Indianapolis, each city more than 600 miles from campus. The second game saw the Grambling State players depart at 6 p.m. on a Thursday night and arrive at 9 a.m. on Friday morning, which left players “drained and exhausted” in a 48-0 loss to Alcorn State. * Athletic administration. The letter claims that the school’s alumni association and a football booster group both have attempted to donate money specifically to the football program, only to have Grambling State reject the help because administrators want to use the funds for the school as a whole. The players also were upset that the school fired head coach Doug Williams — who led the team to a conference title in 2011 — just two games into the season, did not meet with the squad to discuss the layoff for more than a month and failed to replace Williams with “a competent” interim coach. Under Hall of Fame coach Eddie Robinson, Grambling was a longtime college football powerhouse. Williams enjoyed success there, too. Essentially, the school’s program is steeped in tradition, much like Penn State University or the University of Alabama. How could this happen? The men’s basketball team was winless last season (0-28); women’s basketball went 9-23. The women’s soccer team amassed a 3-29 recorded over the 2011 and 2012 seasons and is 0-4 this year. The women’s volleyball team is 9-48 over the last three seasons, including 2-11 in 2013. Other programs have similarly struggled; track & field is the one outlier. Approximately 127 staff members have been laid off since 2008 and furloughs are common. Professors have also been asked to teach an extra class each year for free. Generally, the school has “cut to the bone,” says Leon Sanders, Grambling’s vice president for finance. “We are functioning now in a financial emergency,” Pogue says. Oh. A financial emergency. Is that all? Nope. Grambling students don’t want to pay an additional $100 annual fee to help subsidize athletics, which means sports and the student body as a whole aren’t on the same page. Worse still, the school’s athletic department reportedly has been racked by infighting and instability, with Williams feuding with officials and previous athletic director Percy Caldwell resigning in early July after just over a year on the job. Football doesn’t make money for Grambling; it ran a deficit of more than $1 million last year. Without the appearance of a huge T. Boone Pickens-type donor, it’s fair to ask whether a school like Grambling — despite its rich history — can continue to sustain not just football but all athletics under the current constraints. Speaking of larger questions, is this the first time college athletes have gone on strike and/or threatened to do so? Believe it or not, no. In 1927, Howard University canceled food, housing and tuition payments to the members of its football team; in response, the team refused to play until the food and housing payments were restored. A decade later, members of the University of Pittsburgh football team declined to participate in the Rose Bowl unless given two weeks of vacation and a pocket money allowance increase to $200 per player; the next season, the team’s sophomore players went on strike because upperclassmen were receiving more money through the school’s football payola plans. In 1940, the Stanford football team demanded $50 per player to compete in the Rose Bowl. And in his book “Out Of Their League,” former Syracuse football player Dave Meggyesy writes that before the 1961 Liberty Bowl —a made-for-television game played in frigid Philadelphia in mid-December — he and his teammates told coach Ben Schwartzwalder that they wanted wristwatches. Nice watches, like the ones players were given at the Orange and Rose Bowls. Otherwise, the Orangemen refused to play in the game. Hmmm. College athletes standing up, speaking out and demanding a bigger slice of the economic pie their sweat and labor generates. Sounds like the death of campus sports amateurism, and the National Collegiate Athletic Association’s worst nightmare. Things fall apart. The NCAA as we know it cannot hold on indefinitely, any more than Hosni Mubarak could hold on in Egypt. Everyone knows this. Problem is, the system isn’t falling apart fast enough. It’s stubborn and entrenched. Which makes sense. After all, if you were a college sports powerbroker — a conference commissioner, a university president, a megabucks coach — why would you want anything to change? You make the money. You call the shots. In a neat bit of cognitive dissonance — the same trick practiced by economic overlords everywhere, once known as the White Man’s Burden — you probably have convinced yourself that the great and noble cause of having college football and basketball players work for almost free as living, breathing brand marketing brochures is somehow righteous. We’re doing this for education and the love of the game — oh, wow, you want to give me a million bucks to wear this shoe company lapel pin? In short, you have no incentive to change, and every incentive to keep on keepin’ on. Case in point? [In October 2011], NCAA president Mark Emmert proposed giving college athletes an additional $2,000 cost-of-living stipend — a pittance compared to the billions generated in March Madness television rights, but better than nothing. So what happened? Two months later, 125 member schools asked for an override, suspending the proposal. The upshot was clear: College sports will never become fairer unless they are forced to become fairer. We’ve already seen the All Players United movement this season. Now Grambling State. Are college sports on the brink of a mad-as-hell, not-gonna-take-it-anymore player-driven revolution? Probably not. For one, the Grambling State situation is unique. Players weren’t responding to a somewhat abstract injustice, the financial inequities and denial of basic economic rights that are part and parcel of NCAA amateurism; to the contrary, they were taking a stand against dreadful basic workplace conditions. 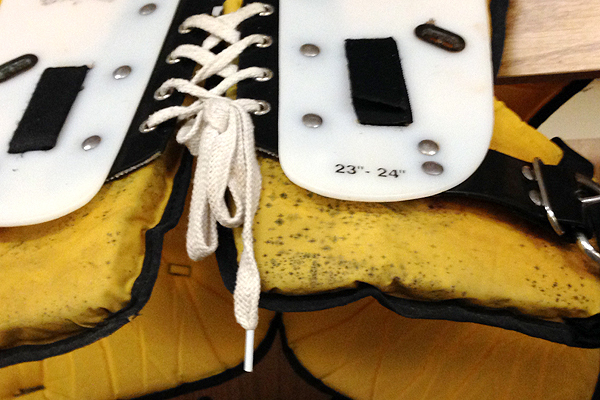 Would you want to play football in a mold-ridden pair of shoulder pads? Moreover, the Grambling State players likely felt they had less to lose by speaking out than, say, players at Ohio State, many of whom hope to play in the National Football League. Suppose players were able to overcome their fears, unify and strike. What would happen? 15.3.4.2.3 Fraudulent Misrepresentation. If a student-athlete is awarded institutional financial aid on the basis of declaring intention to participate in a particular sport by signing a letter of intent, application or tender, action on the part of the grantee not to participate (either by not re- porting for practice or after making only token appearances as determined by the institution) would constitute fraudulent misrepresentation of information on the grantee’s application, letter of intent or financial aid agreement and would permit the institution to cancel or reduce the financial aid. Now, network executives probably don’t care about the essential wrongness of amateurism, any more than textile plants care about how plantations are run. They just need the final product. Cotton. Games. Programming. They need to fill hours, attract viewers, harvest and sell the resulting eyeballs to their sugar daddies, advertisers and cable providers. No compelling programming? No profits. Take away a big-money, big-ratings property like the March Madness or the BCS bowl games, and the networks are in a bind. You might have a point. According to reports, the Grambling State players have agreed to end their strike in exchange for promised facility upgrades. Will they actually get what they want? Given the school’s overall financial problems, perhaps not. Still, remember Meggyesy’s Syracuse team? The one that threatened not to play in the Liberty Bowl? They got their watches. Striking works. Even when you’re not an official employee.